The eBay treasure chest is overflowing with delights, and occasionally the treasures are startling. I’ve come to expect autographed records and photographs and concert programs, as well as little scraps of paper cut from someone’s autograph book. There’s been a recent flurry of checks — bearing the signature of an otherwise obscure musician on the back as the necessary endorsement. And more, some of it dross. I am always slightly ambivalent about the rarities coming to light. On one hand, what a joy to see relics and artifacts that one never knew existed. On the other, I feel melancholy that these offerings are (plausibly) because collectors age and die, need money, and their heirs are understandably eager to convert the fan’s collection into something more useful at the mall. But it’s all just objects, and they go from one hand to another: better this than the recycling bin. The musicians Nat photographed are (in no order of merit): Miff Mole, Buddy Rich, Earl Hines, Oscar Peterson, Patti Page, Art Hodes, Jonah Jones, Louis Jordan, Jim Robinson, J.C. Higginbotham, Eddie Heywood, Darnell Howard, Lee Collins, Louis Prima, Flip Phillips, Oscar Pettiford, Freddie Moore, Red Norvo, Tal Farlow, Charles Mingus, Pee Wee Hunt, Juanita Hall. They were caught in action at clubs, the State Theatre in Cleveland, a rib restaurant, and elsewhere. (Flip, Rich, and others may have been on a JATP tour.) It’s a powerful reminder of just how much live music there was in this country. Here are a few samples, but go see for yourselves before they are all purchased. As some anonymous pitchman once said, “When they’re gone, they’re gone!” I am not involved in this beyond this blogpost: I spent the February budget for such things on photographs of Vic Dickenson and Sidney Catlett. The rest you’ll have to find for yourselves. But what a cache of marvels, and the treasure chest seems bottomless. And the imagined soundtracks reverberate gloriously. Posted in "Thanks A Million", Bliss!, Generosities, Ideal Places, Irreplaceable, It's A Mystery, It's All True, Jazz Titans, Pay Attention!, Swing You Cats!, That Was Fun!, The Real Thing, The Things We Love, Wow! Slowly, slowly, our awareness of Louis Armstrong spreads and deepens. Of course, someone out there is still saying that everything after POTATO HEAD BLUES was a colossal misstep. And somewhere, another gently misguided soul is suggesting that “Louis Armstrong was the worst thing that ever happened to traditional jazz,” which is a direct quotation and one that tried my peaceful nature to the breaking point. But many people understand or have come to understand — to feel — that whatever Louis touched, he made beautiful. So I write what I believe: that the recordings newly issued by Universal, annotated by our own local hero, Ricky Riccardi, are some of Louis’ greatest. They are masterpieces of technique, drama, and above all, emotion. And if I hear whimpers, “But they’re commercial! The songs are so beneath him,” I will call Security to clear the room. Here is the official link to the Universal Records issue — 95 songs, available through Apple here for download. No, they aren’t going to be issued on CD. Downloads, like love, are here to stay — so ask a niece or nephew to assist you. And if the idea of intangible music — sounds without a tangible disc, shellac, vinyl, or plastic, is odd and threatening, think of downloading as new-fangled radio. However, there are characteristically wise and rewarding liner notes by Mister Riccardi, about fifty thousand words, so knock yourself out here. I believe that the cost for the whole package is $44.95 and individual tracks are priced at $1.29, which is not prohibitive. As we have gotten used to cheap food in the last forty or fifty years, we also expect music to be free. Silliness and selfishness, but that’s another blogpost. This one is to celebrate Louis. I listened to all ninety-five sides recently, and I am floating. I grew up with some of these recordings — Louis and Gordon Jenkins, especially — so they are very tender artifacts to me. I came to Louis slightly later than the time period of this set: I think I bought my first record in 1963, although the experience of buying individual 45 rpm discs in paper sleeves is a part of my childhood. Department stores had record departments, as did the “five and dime” stores, Woolworth’s, Kresge’s, W.T. Grant, so hanging out there was a real part of my childhood and adolescence. Of course, I separated myself from my peers early, but that is not something I lament. In the Sixties and Seventies, Decca collected many of these sides on 12″ lps — SATCHMO IN STYLE, SATCHMO SERENADES, and the like. This is to say that perhaps ten of the ninety-five sides were new to me, but the music is astonishing throughout. Several aspects of this set are powerful to me and will be to you. One is the trumpet playing. Louis’ unrivaled ability to make a “straight” melody come alive — “tonation and phrasing,” he called it — shines through every track. Listeners who only see brass instruments in the hands of people who have spent the requisite ten thousand hours may not know how difficult what he does, casually, from track to track. Ask a trumpet player how easy it would be to reproduce four bars of Louis. I think you will be startled by the answer. I know people rightly hold up his recordings of the Twenties and Thirties as examples of astonishing grace and power — and they are — but his trumpet playing in 1949-1958 is awe-inspiring, his huge sound captured beautifully by Decca’s engineers. Another pleasure is the alchemy Louis works on the material. For those who are appalled by, let us say, YOUR CHEATIN’ HEART or SKOKIAAN, I ask them to take a deep breath and evaluate the lyric and melodic quality of, perhaps, THAT’S WHEN I’LL COME BACK TO YOU before criticizing the “pop” material. And if a record of WINTER WONDERLAND brought people to hear and warm to Louis, then the large reach into popular songs — nothing new — that Jack Kapp and Milt Gabler did is a very good thing. The final thing that kept revealing itself, over and over, was Louis’ deep innate romanticism, his delight in singing and playing about love — hopeless love, disappointed love, fulfilled love — all the shadings from bleak to ecstatic. Even those people who admire Louis as I do have not always given him credit as a great poet of love, vocally and instrumentally. His dramatic sense is peerless on these records. I know that 2016 has been a dazzling year for reissues and issues of material never heard before — consider several new Mosaic sets and the two volumes of material from the Savory collection — but this music is extraordinary: you can’t afford to miss these dreams. I’ve seen and heard a great deal of live jazz performance since 2004 (and before then) and occasionally I feel as if the video camera has been grafted on my body (“More than five thousand published YouTube videos,” he said immodestly) — but the band that follows is one of my great pleasures. It’s a delicious hybrid of deep New Orleans, Bob Crosby Bobcats, Teddy Wilson and Basie small groups. I speak of Tim Laughlin’s All Stars featuring the master of melody on clarinet; Connie Jones, cornet; Doug Finke, trombone; Chris Dawson, piano; Marty Eggers, string bass; Hal Smith, drums. Here they are in all their delightful gliding majesty at the 2014 San Diego Jazz Fest. I treasure these musicians and these performances, and feel privileged beyond words that I have been in the same room (with a camera) with these masters. I’m a very tough audience when it comes to jazz history books. Many of them, understandably, are pastiches of familiar evidence with big helpings of speculation mixed in. Nice enough for people new to the subject, but give me first-hand information rather than paraphrases of what has already been published. In addition, most jazz literature seems star-struck, fixated on the forty or fifty BIG NAMES. That’s splendid: books about Louis, Lester, Ben, Hawkins, Roy, Red, and others are treasures. But since the musicians themselves didn’t always get the attention they merited, much jazz biography is brilliant posthumous research. If someone were to turn up pages by Walter or Hot Lips (I couldn’t resist) they would be priceless. And the people who never get to report on what they saw, felt, heard, experienced are likely to have the best stories to tell. This brings us to Peter Vacher’s new book, SWINGIN’ ON CENTRAL AVENUE: AFRICAN AMERICAN JAZZ IN LOS ANGELES (Rowman & Littlefield, 2015, 331+ pages, many photographs). It is an irresistible book, and I speak as someone who finds many books — after decades of reading — utterly resistible. Peter Vacher (much like the recently-departed John Chilton, although Peter is still very much alive) is one of those rare multi-talented writers: a splendid unaffected prose stylist, a very diligent researcher and “connecter,” someone with an eye for what’s true and what’s intriguing. In this case, he offers us oral histories and historical research into the lives and music of sixteen musicians — his research done over more than two decades. The musicians profiled are Andrew Blakeney, Gideon Honore, George Orendorff, “Monk” McFay, Floyd Turnham, Betty Hall Jones, “Red Mack” Morris, Caughey Roberts, Chester Lane, Monte Easter, Billy Hadnott, Norman Bowden, John “Streamline” Ewing, Chuck Thomas, Jesse Sailes, “Red” Minor William Robinson. I knew of perhaps one-half of those musicians: Blakeney had played with Kid Ory; Honore with Jimmie Noone; Orendorff with Les Hite and Louis; “Red Mack” with Lee and Lester Young’s band; Caughey Roberts had been replaced in the early Basie band by Earle Warren; Billy Hadnott was on famous JATP recordings as well as with Nat Cole; Norman Bowden had recorded with Zutty Singleton; “Streamline” Ewing had played with Hines, McShann, Horace Henderson. Because of the “star-system” in jazz, many might assume that these interviews with people who — apparently — were on the fringes of the big time would be narrow and not terribly interesting. To assume this would be a huge error. For one thing, these sixteen people hadn’t been interviewed much, if at all, so their reminiscences are fresh and eager, full of good stories. Not one page in Vacher’s book has the stale, “Must we go through this again?” quality of the recitals the stars have given so often they take on an inescapable sleepiness (both in the speaker and the reader). Although many older musicians expressed themselves through their instruments, sometimes their narratives are enthusiastic but closed: “Big Boy was a terror when he got into that whiskey, but he sure could blow.” Not here. And Vacher’s interludes are brief, lively, and the very antithesis of narcissism: he shines the light with great skill and affection on his subjects. And the stories are amazing. Andy Blakeney was in Chicago when Louis joined King Oliver; he played in a Doc Cooke band. Streamline Ewing was asked to join the Basie band; he heard Charlie Parker before Bird had made records. Speaking of Bird, he stayed with Billy Hadnott and his wife — and it’s a sad story — before the Hadnotts were compelled to ask him to leave. Ewing also mentions seeing both Mutt Carey and Nat Cole at the union — consider that pairing! Norman Bowden talks of rehearsing with Jelly Roll Morton, “the most sophisticated man I ever met in my life,” in 1940. We hear of Benny Goodman sitting in with Mutt’s band in 1925; the book offers the first substantial sketches of drummer Cuba Austin, of bandleaders Reb Spikes, Sonny Clay, the pianist Lady Will Carr. We learn — in just a sentence — that the short-lived and extremely talented pianist Margaret “Countess” Johnson was Lester Young’s “heartbeat.”That Eddie Nicholson was Billie Holiday’s drug supplier. There are extended stories about a young Charlie Christian, about Lester, about the Basie band at the Reno Club in 1935, about Louis, marijuana, Charles Mingus, Buck Clayton in Shanghai, Lionel Hampton in 1936 . . . And some musicians, like Kid Ory and Christian, pop up in different contexts, so one has the advantage of seeing them as if they were characters in a Faulkner novel, from many angles. And there’s more. Extraordinary photographs, many from the subjects’ personal hoards. Interludes of fact taken from contemporary music magazines. And, should you think this to be simply a collection of oral histories of little-known musicians retelling their careers, the book presents so much more — as in race and racism from the Twenties onwards. Not all the stories are grim, but they are all revealing. I offer only one example — in Billy Hadnott’s section, Vacher includes this comment from DOWN BEAT, March 15, 1944, where Frankie Laine and a four-piece “mixed group” are praised for their music, then the reporter notes, “Despite their excellent air shots the group has found difficulty in club bookings because of the racial angle involved in the mixed group. Setup includes two colored and three ofays, and it will be interesting to find if this group can break through the Jim Crowism so strong out here.” That quotation — both in subject and style — is worth a good deal of study, and it reminds us that there were two unions at the time in Los Angeles. Such fascinating evidence spills out of Vacher’s book — because his subjects haven’t simply played or lived locally, and they are people one would otherwise know only as names in discographies or on record labels. The book is entertaining, powerful, and eye-opening. Peter Vacher has surpassed himself, and that is saying a great deal. Now I’m going back to read more. As a postscript, I opened the book at random and found Chester Lane’s story about working with Bob Alexander’s Harmony Kings in El Dorado, Arkansas, circa 1928, with Louis Jordan . . . and the band is taken over by one Wilson, who owns Wilson’s Tell-‘Em-‘Bout-Me Cafe. I’ll stop there, but you will see why such real-life details make the book a deep pleasure. 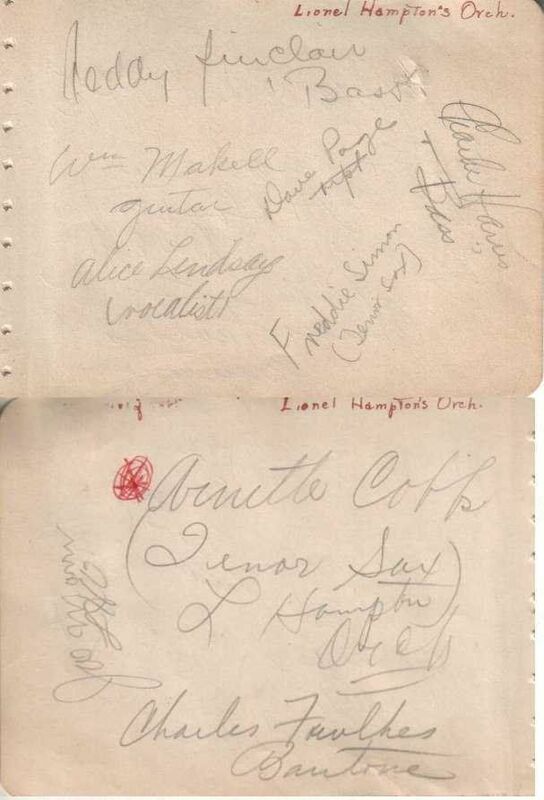 4×6’ album page autographed by Teddy Sinclair, Dave Page, William Mackel, Alice Lindsey, Freddie Simon and Charlie Harris on one side, and Joe Marr, Arnette [later Arnett] Cobb and Charles Fowlkes on the back. 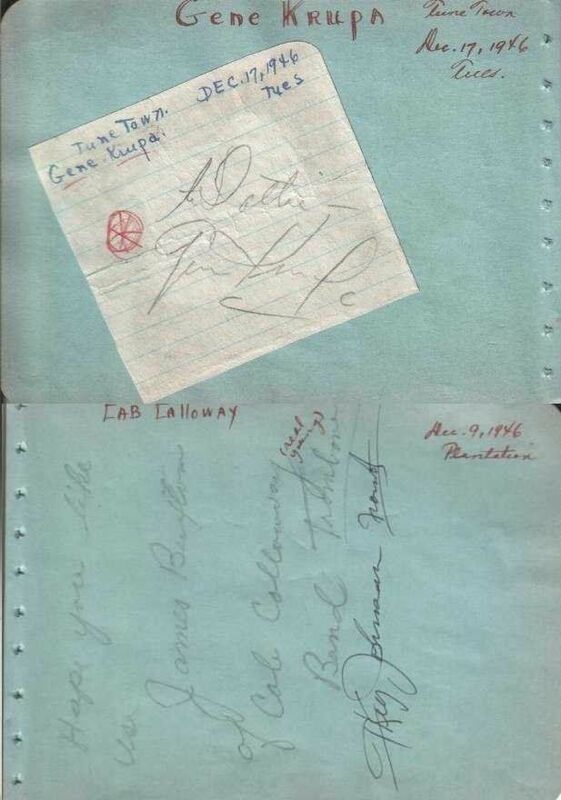 The signatures were obtained on September 24, 1946. A 4×6’ album page autographed by Velma Middleton, Larry Anderson, Big Chief Moore and on the back by Norman Powe and Elmer Warner. 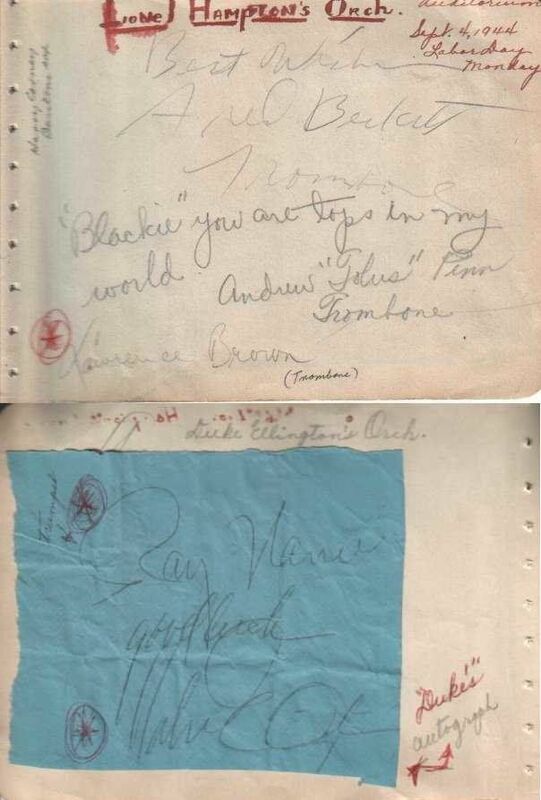 These were signed on February 10, 1945. 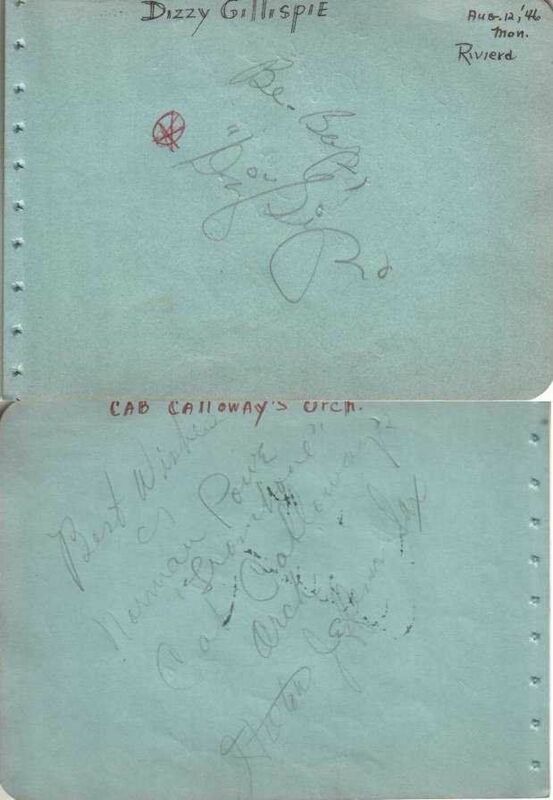 A 4×6’ album page autographed by Dizzy Gillespie (signed Be-Bop, Big Diz) and two members of the Cab Calloway Orchestra in Norman Powe and Hilton Jefferson. These were signed on December 7, 1946 and August 12, 1946. 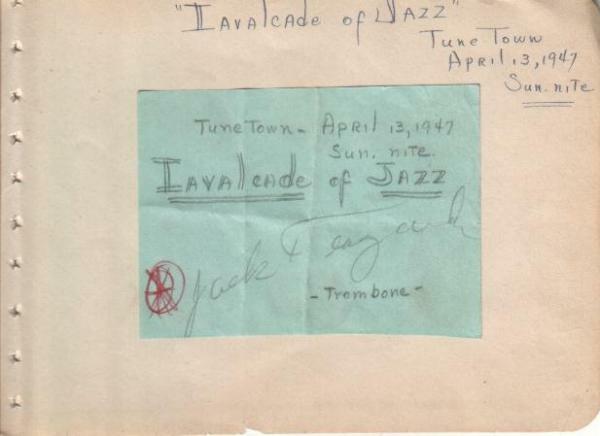 A 4×6’ album page with an affixed cut measuring 3×4’ autographed by Jack Teagarden in pencil, with a notation that it was signed at Tune Town on April 13, 1947 as part of the Cavalcade of Jazz. 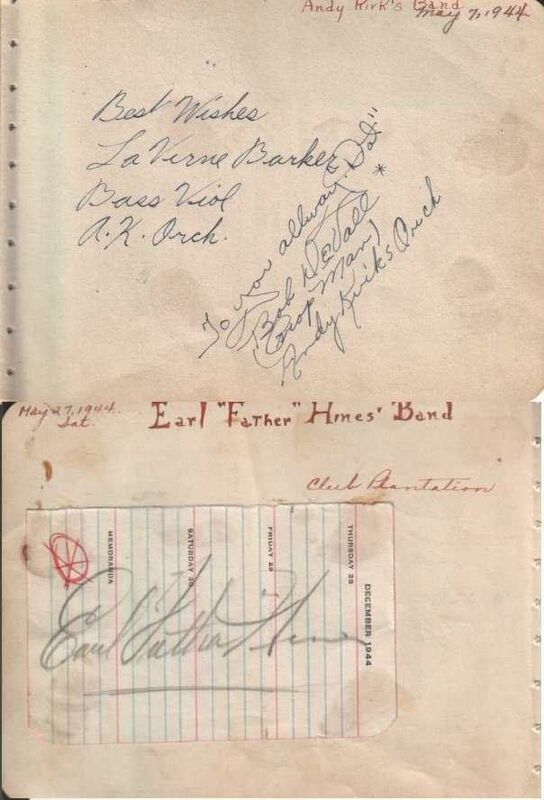 A 4×6’ album page autographed by Leslie Scott and on the back by James “Coatsville” Harris, Adam Martin, Elmer Warner and Ed Swantson, all then members of Louis Armstrong’s band. 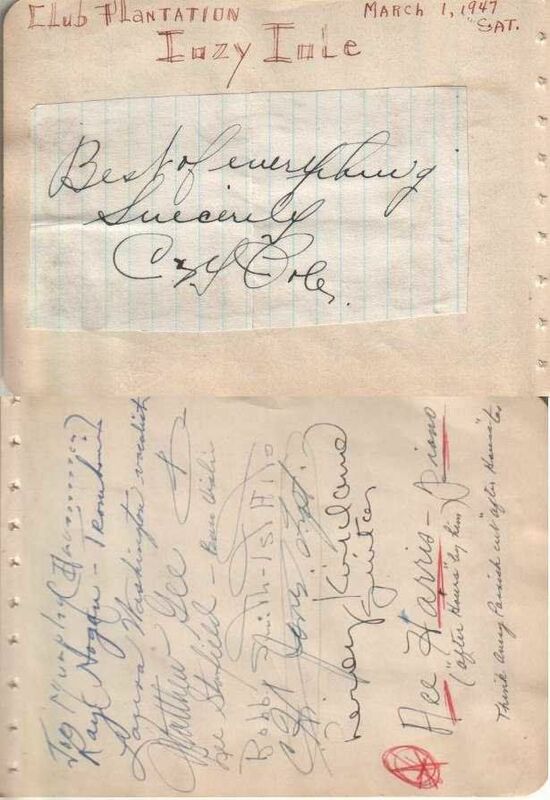 A 4×6’ album page autographed by Count Basie, Jimmy Rushing, Joe Newman, Dickie Wells, Harry ‘Sweets” Edison, Joe Newman one side, and Dickie Wells (another), Harry Edison, Al Killian, Louis Taylor and Ted Donelly on the on the back. 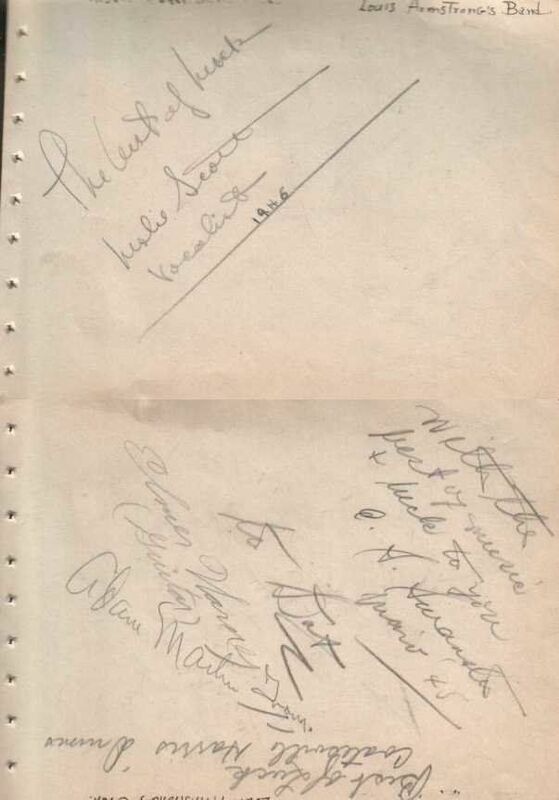 The signatures were obtained on June 25, 1944. 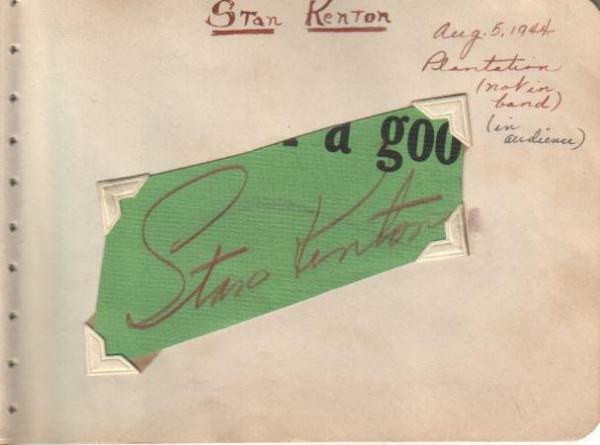 A 4×6’ album page autographed by James Buxton and Keg Johnson and on the back, an affixed cut signature of Gene Krupa. These were signed on December 17, 1946 and December 9, 1946. A 4×6’ album page autographed by La Verne Barker and Bob DeVall (Andy Kirk’s valet or band manager?) on one side and Earl ”Fatha” Hines (glues to the page) on the back. 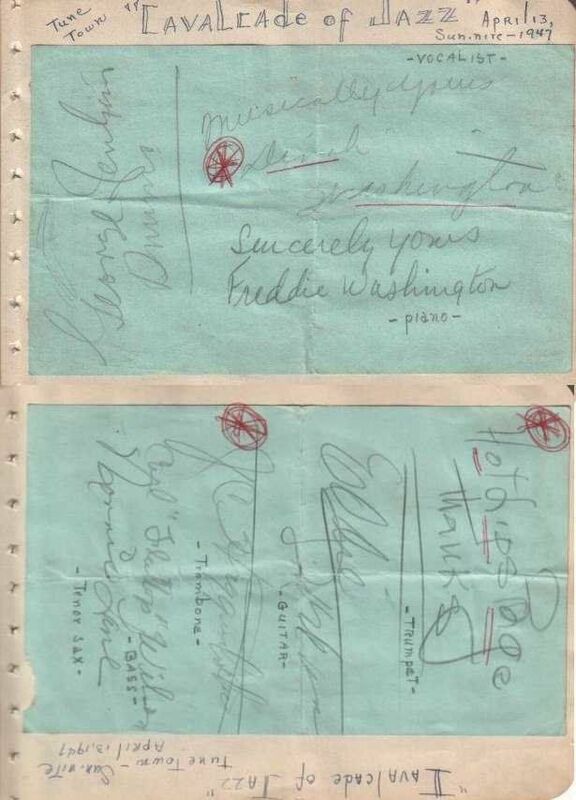 The signatures were obtained on May 7, 1944, and one side had McGhee, while on the reverse are the others. 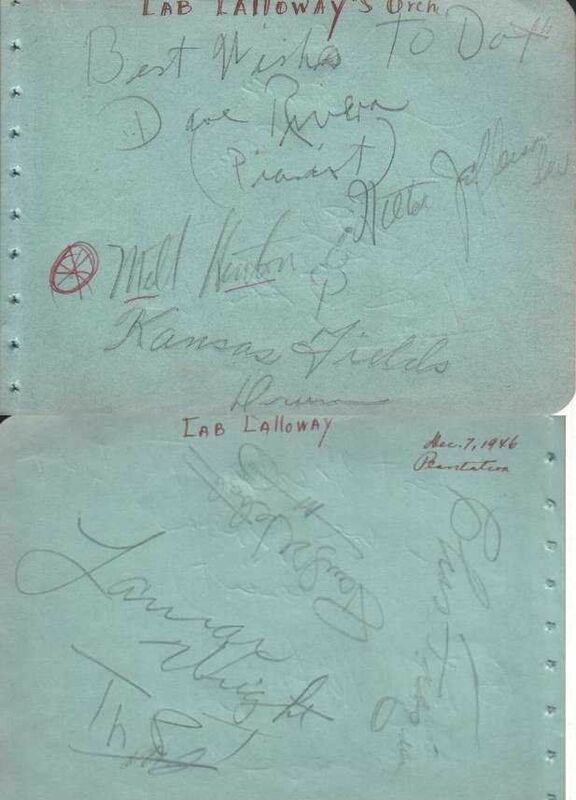 A 4×6’ album page with an affixed paper autographed by 8 Jazz greats, including Dinah Washington, George Jenkins, Freddie Washington and on the back by Hot Lips Page, Carl Wilson. Ronnie Lane and J.C. Higginbotham. It is noted that this was signed at Tune Town on April 13, 1947 as part of the Cavalcade of Jazz. 4×6’ album page autographed by Dave Rivera, Kansas Fields, Milt Hinton, Hilton Jefferson and on the back by Lammar Wright, Charles Frazier and Paul Webster. These were signed on December 7, 1946. 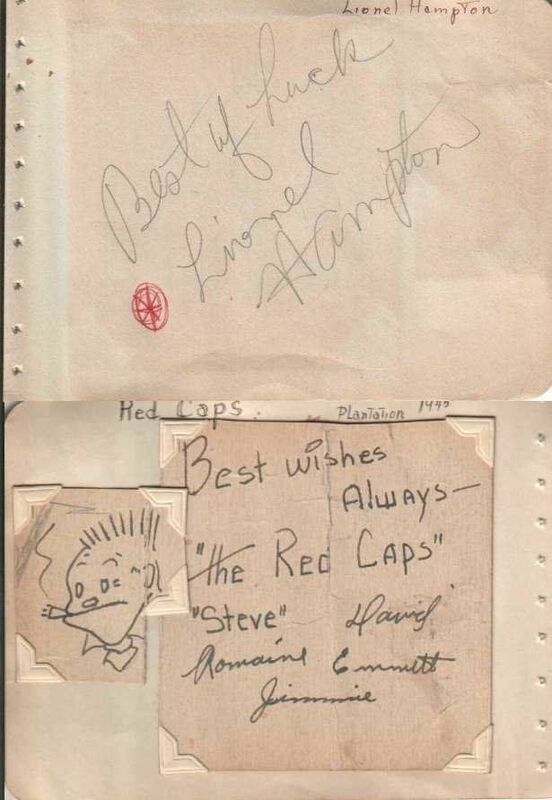 A 4×6’ album page autographed by Lionel Hampton and on the back by The Red Caps (signature affixed within the book), and signed in 1945. 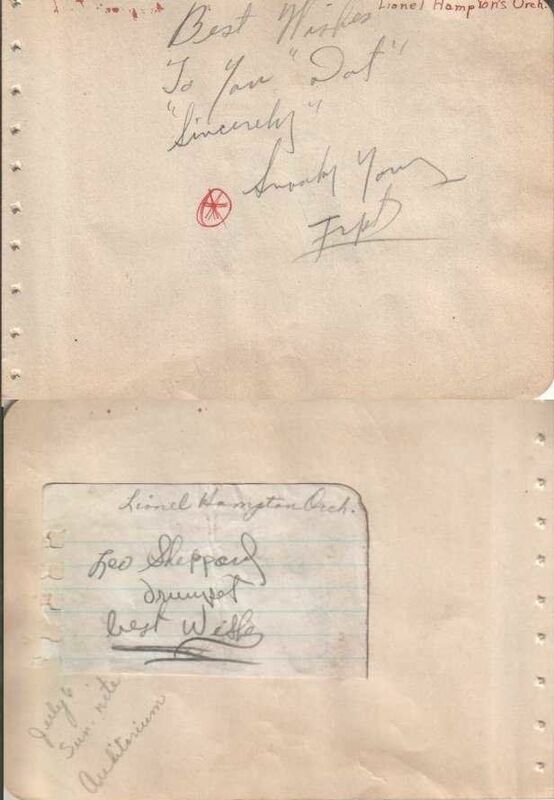 A 4×6’ album page autographed by Snooky Young and on the back by Leo Sheppard (signature affixed within the book), and most likely signed in 1946. Stan Kenton, in the audience, 1946. A 4×6’ album page autographed by Edward Loving, Jimmy Forrest, Ben Smith and Ben Thigpen on one side, and Wayman Richardson, (Art?) and J.D. 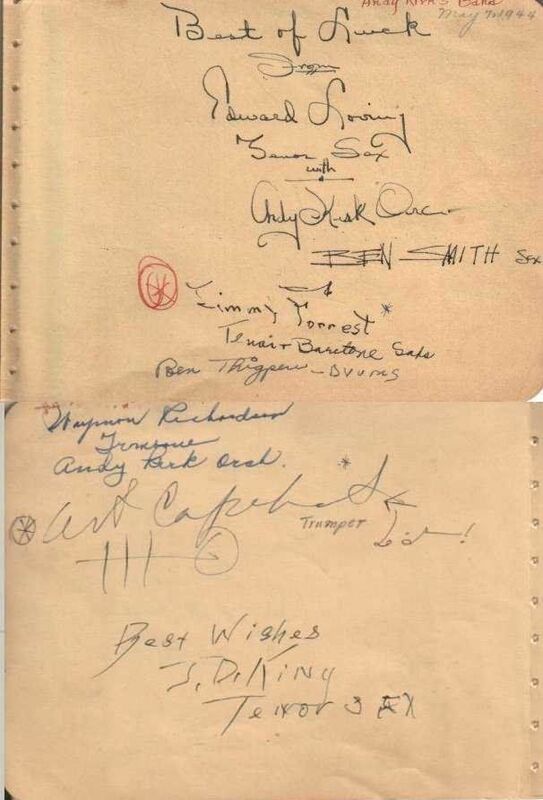 King on the back.The signatures were obtained on May 7, 1944, and one side had Howard McGhee. 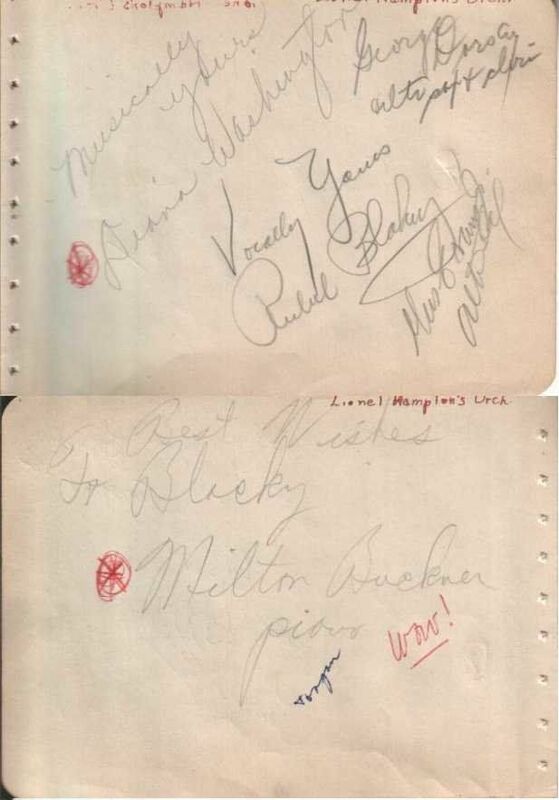 A lot of two 4×6’ album page autographed by Dinah Washington and three others, and on the back is signed by Milt Buckner. 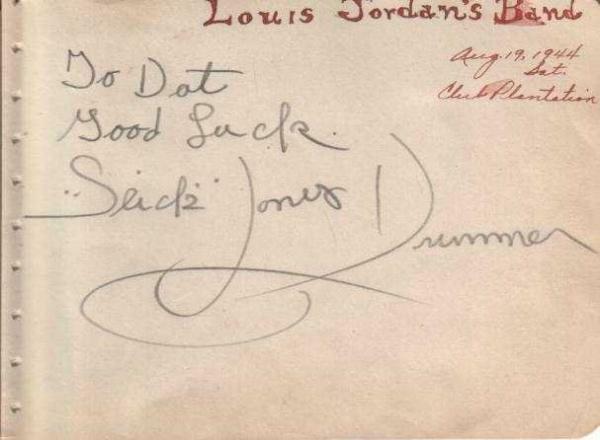 A 4×6’ album page autographed by Slick Jones, dated August 19, 1944. 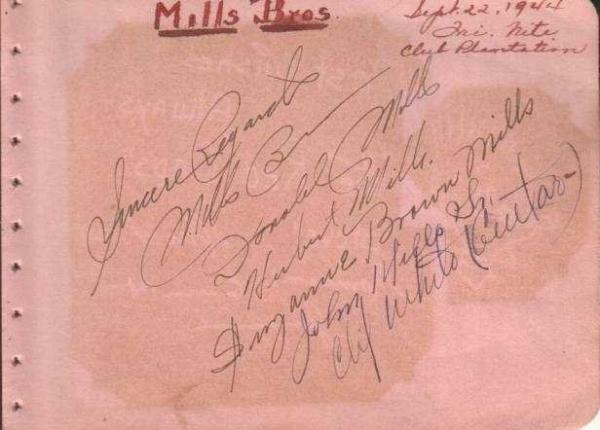 A 4×6’ album page autographed by The Mills Brothers, Herbert (April 2, 1912 – April 12, 1989), Donald (April 29, 1915 – November 13, 1999) and John Mills Sr.(February 11, 1882 – December 8, 1967). This was signed on September 22, 1944. 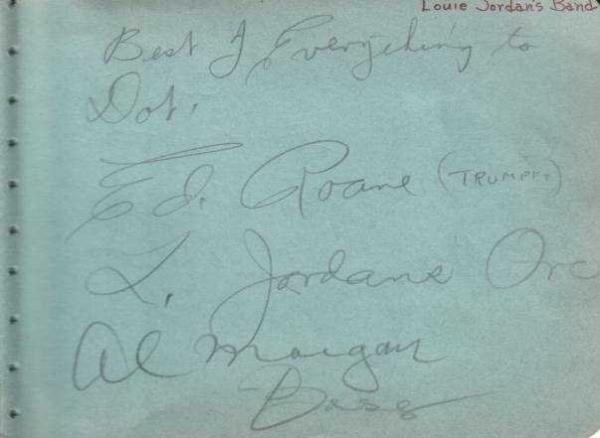 A 4×6’ album page autographed by Al Morgan and Ed Roane. 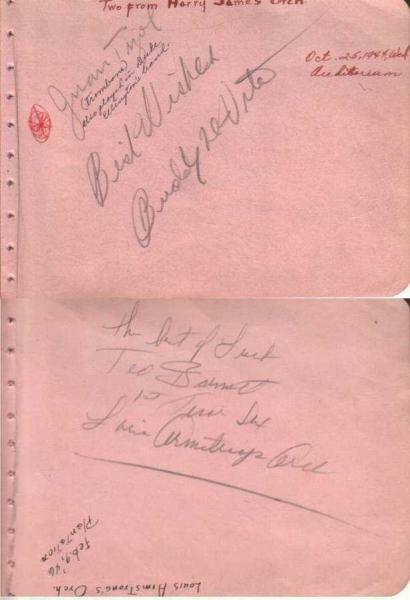 A 4×6’ album page autographed by Juan Tizol and Buddy Devito from the Harry James Orchestra and on he back by Ted (Barnett?) from the Louis Armstrong Orchestra. 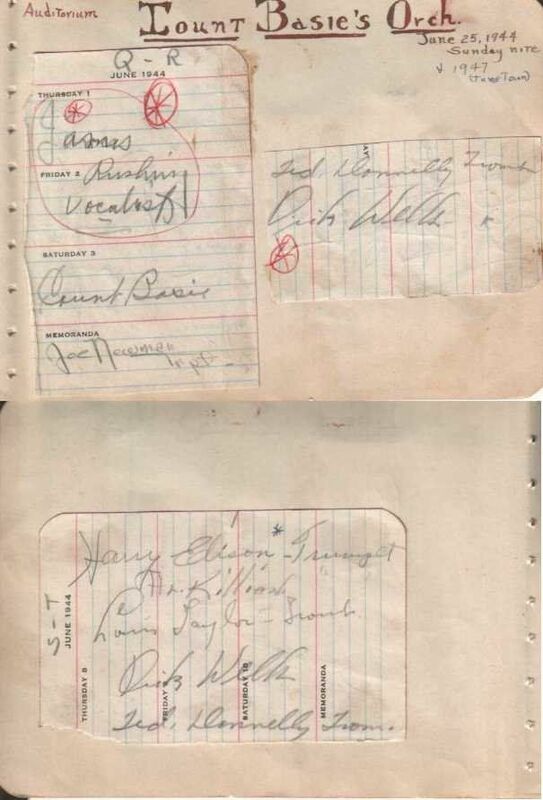 These were signed on February 9, 1946. 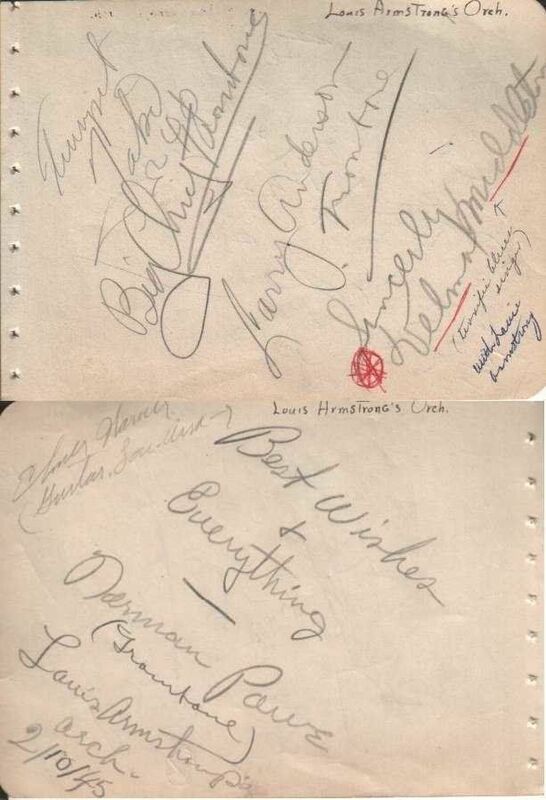 A 4×6’ album page autographed by Ace Harris, Leroy Kirkland, Joe Murphy, Ray Hogan, Laura Washington, Matthew Gee, Lee Stanfield, Bobby Smith, C.H. Jones and on the back, affixed to the page is the signature of Cozy Cole. These were signed on January 7, 1947 and March 1, 1947. 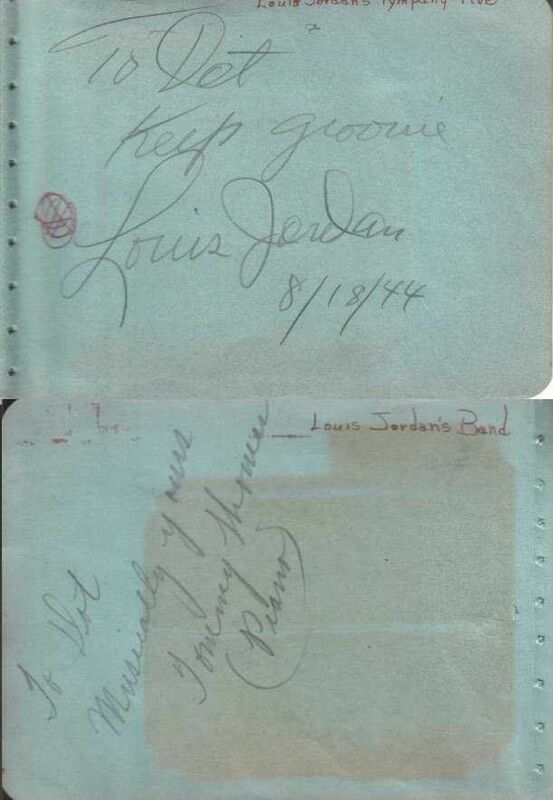 A 4×6’ album page autographed by Louis Jordan on one side (dated August 18, 1944) and on the back by his piano player Tommy Thomas. “Keep groovin”! indeed. There was a time when giants swung the earth. Blessings on them, and also on people like Dot, who kept them alive for us, seventy years later.